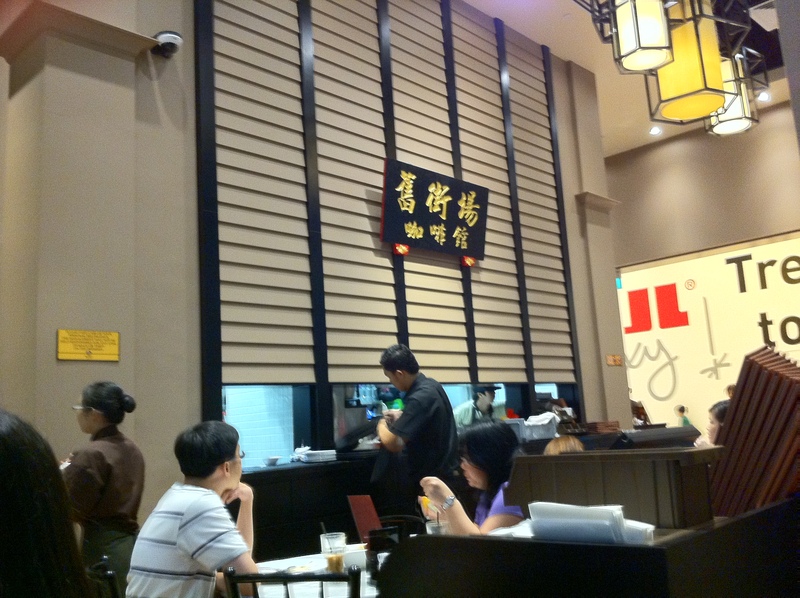 Today, hubby and I went to check out the new shopping mall in Jurong East, a neighbouring town. Ah…the joy of having older teenagers 😛 The mall is called JCube and even though not all shops are open yet, it is teeming with people already. What I noticed there is that there are at least 3 outlets that sell ice-cream or gelato. These establishments are sprouting up everywhere it seems. 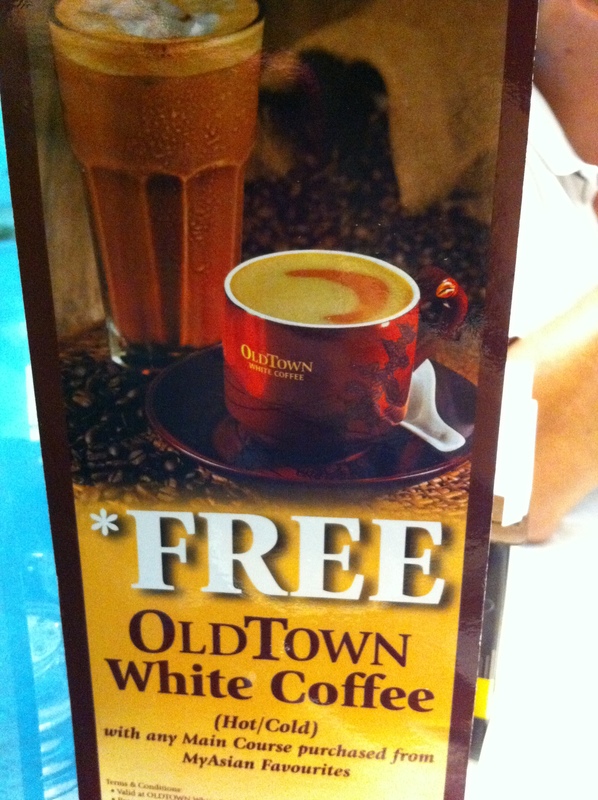 After making the rounds around the mall, we decided to eat at the Old Town White Coffee. The picture of its chicken curry attracted us so despite the hunger, we stood in line and waited for almost 20 minutes to get a seat. 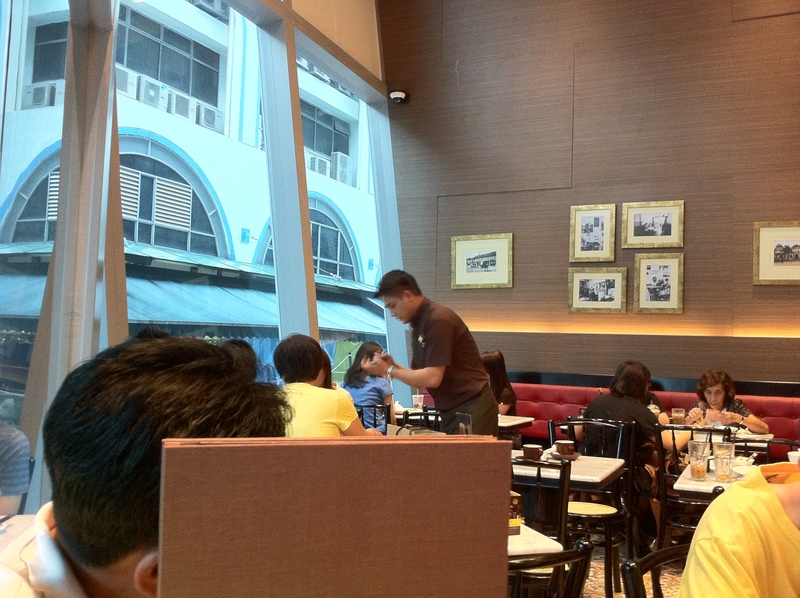 To be fair, all the establishments, except a pizza joint, had long queue (told you Singaporeans love to eat 🙂 ) Our table was beside the glass wall looking out to the row of shops in the opposite building. We had decided on what we wanted to eat while queuing outside so our food arrived shortly after being seated since there was no deliberation over the menu. 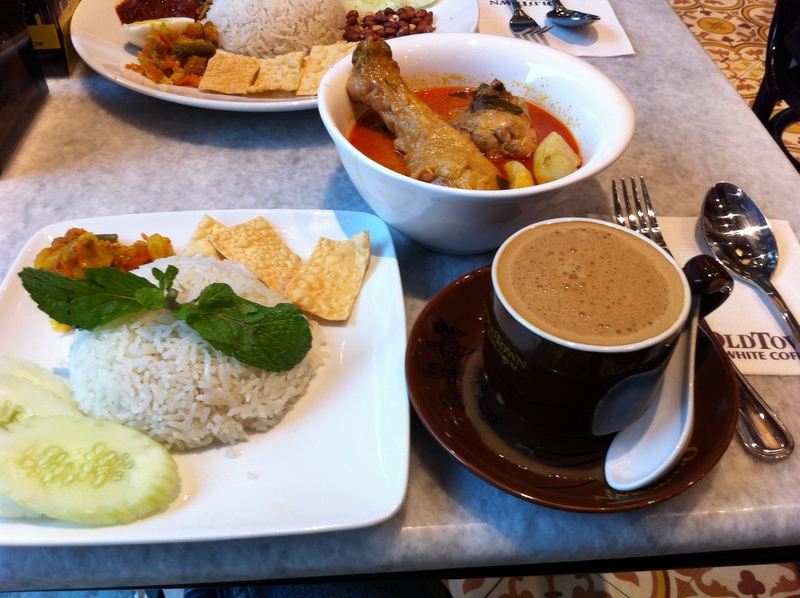 I had curry chicken with rice while hubby had nasi lemak with cuttlefish (or sotong). Hubby took one look at the rice and remarked that it’s meant for baby En En (for those who don’t know, En En is my baby niece 🙂 ) Good thing we also ordered a side of peanut butter French Toast (forgot to take picture of that before hubby devoured it :P). The curry chicken was disappointing but we’ll come to that later. I just had to comment that the table was too small for the amount of food we ordered. 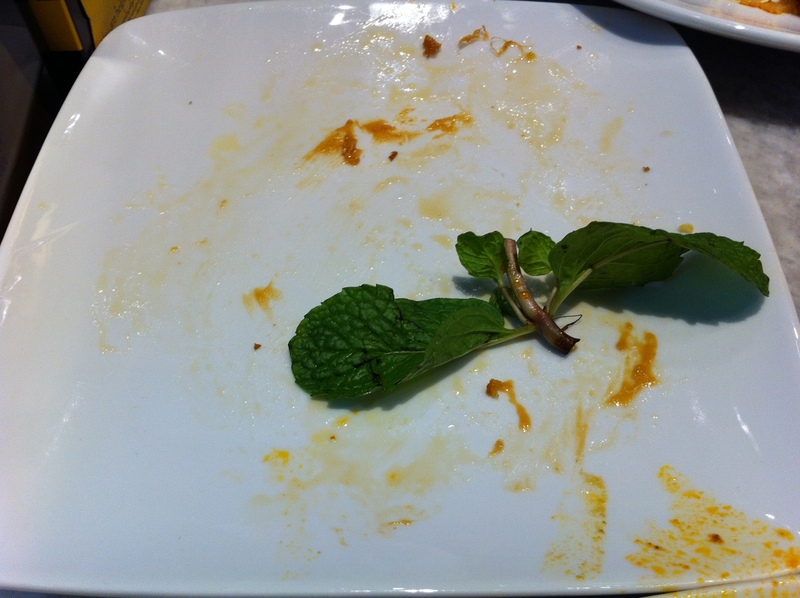 There was barely enough space for the plates of food, hubby’s plate even sat over the edge of the table. Thank goodness it didn’t land on his lap while he ate. That would’ve pushed him over the limit since before that, while the waiter delivered his ice coffee, he splattered a drop onto hubby’s bermuda shorts. Hubby grumbled a little as he tried to remove the stain and I just continued eating my curry and rice, not wanting to encourage his ‘behaviour’ LOL It worked; he didn’t let it bother him longer than necessary and we had a pleasant lunch. Back to the curry chicken. Well, it was disappointing like I mentioned earlier. The curry was too watery and what was even worse was that the potato that is just as important as the chicken pieces in the curry was cooked in the wrong manner. The potato is supposed to be cooked together with the curry and not fried like french fries and then added to the soup when served. That way, it will soak up the fragrance and taste of the curry spices and blend in with the curry. When I eat curry, I actually prefer the potato to the chicken (just like my mum) because it soaks up the curry really well but not today; the potato was tasteless 😦 Mum’s curry chicken is still the best! 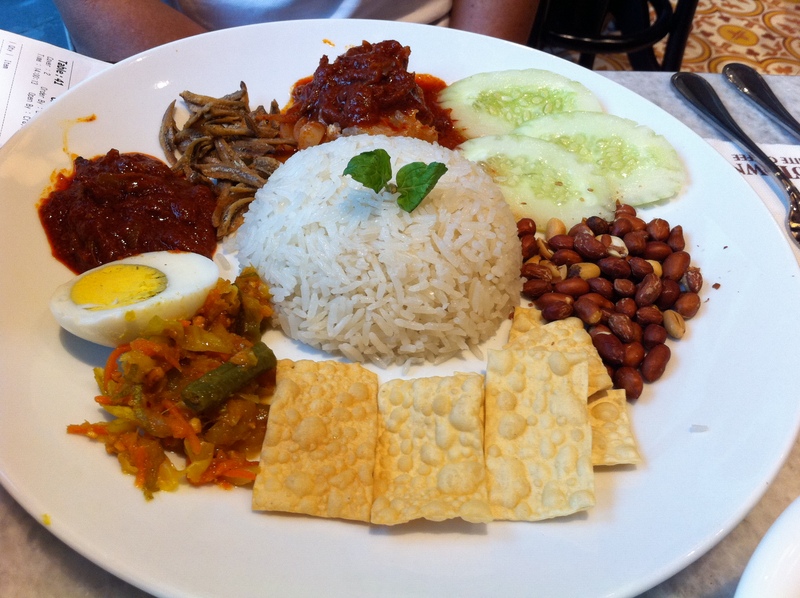 Apart from the small portion of rice served, hubby did not complain about his nasi lemak so I guess it was ok. I had to eat the anchovies and peanuts for him because his teeth aren’t strong enough to chew them. The peanut butter French toast was a disappointment too for it was too greasy. I took two bites and felt like I had too much. It was soggy, possibly with too much butter added on top of it. I’ve just realized you’re a foodie! Loved your commentary, with your vivid descriptions I could almost smell the curry. Maybe you could add ‘food critic’ to your resume. I love your blogs! 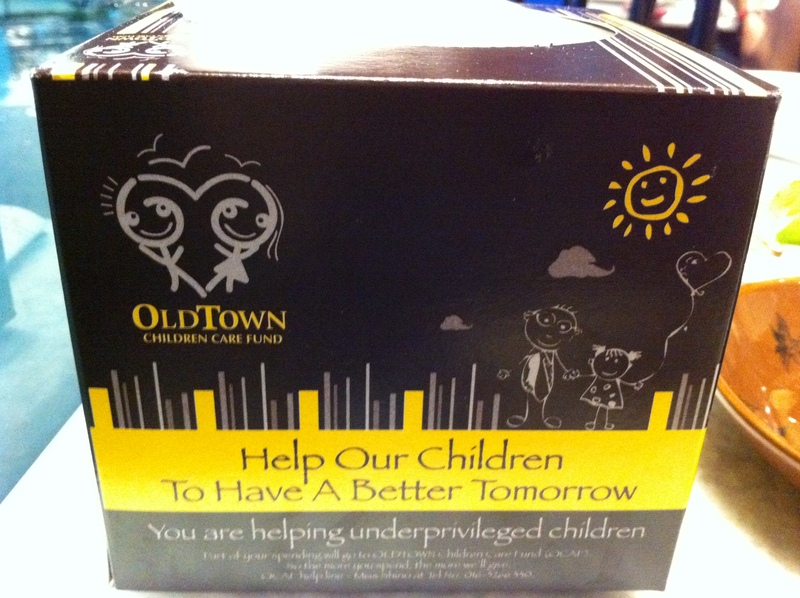 Very nice that the restaurant supports the under-priviledged kids. More should do just that. Thanks, Carol. I need more time to blog!